Egypt is in north-eastern Africa with its capital located in its largest city, Cairo. Egypt also extends into Asia by virtue of holding the Sinai Peninsula. It is bordered by Israel and the Gaza Strip to the north-east, by Jordan to the east, by Sudan to the south and by Libya to the west. The country is bounded by the Mediterranean and Red Seas (to the north and east respectively) and geographically dominated both by the Nile River and its fertile well-watered valley and by the Eastern and Western deserts. Egypt is perhaps best known as the home of the ancient Egyptian civilization, with its temples, hieroglyphs, mummies, and - visible above all - its pyramids. Less well-known is Egypt's medieval heritage, courtesy of Coptic Christianity and Islam - ancient churches, monasteries, and mosques punctuate the Egyptian landscape. 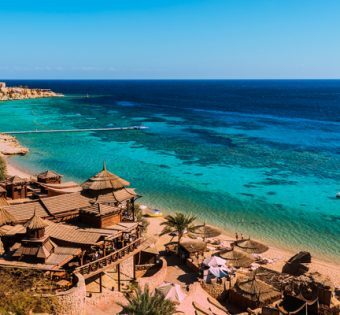 Egypt stimulates the imagination of western tourists like few other countries and is probably one of the most popular tourist destinations worldwide.